Holy long swim! I knew from all the training and those long hours of mind-numbing back and forth in the pool that it was going to take a while but... geez! Spoiler alert - I finished! 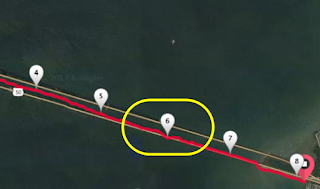 Here's the breakdown of the swim... red line is my path. I was eager to know the water conditions that day, and was happy that it seemed calm (meaning, no whitecaps) as we drove over the bridge to the parking lot. Later at the pre-swim meeting, the race director indicated that conditions were as close to ideal as we could get. I breathed a huge sigh of relief. Not that it was going to be easy by any means. There would be a current pushing us to our left, which we'd have to swim against to get under the bridge. 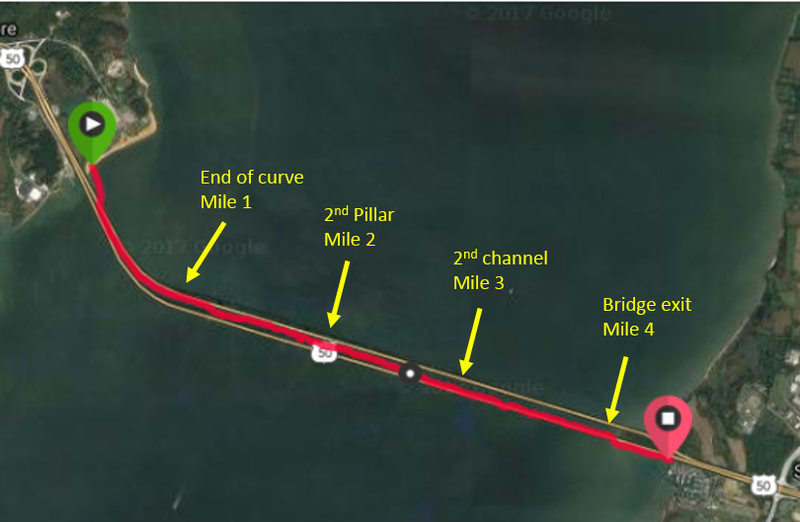 Then at some point, the current would shift to the right, which hopefully would give us a push out of the bridge and into the finish. The swim course was defined as staying between the bridge spans. If you went outside of that area, you were subject to disqualification. You would also be disqualified for hanging onto one of the pylons, mostly because there were too many jagged rocks around those and it was a safety issue. 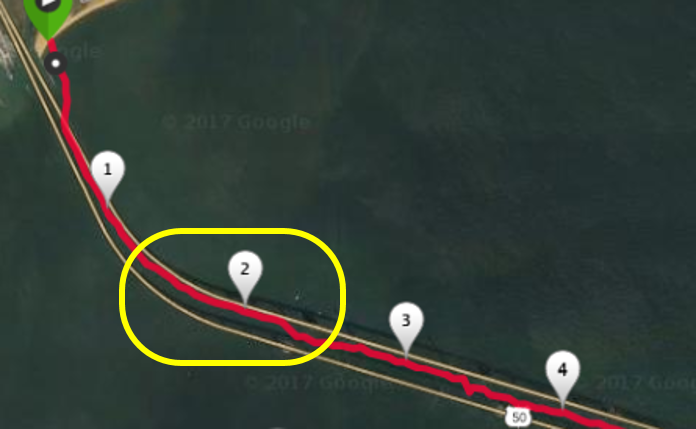 There were to be 2 support boats located at mile 2 and mile 3. You could hang on to those boats, or any kayak or paddleboard, provided the boat was not pulling you along. So there we were on the beach of Sandy Point, all checked in, body marked and timing chip secured. 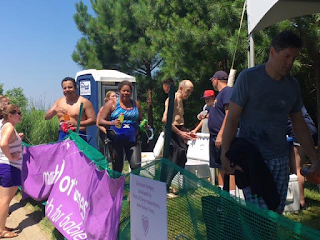 Bags were checked, race number tucked under the swim cap, goggles and index card in hand (yet another safety measure because the race directors had to report everyone entering and exiting the water to the coast guard). I spent some time with Andrea and her crew, said hello to Susan, Tom and John from swim camp, and then settled in with my Team Z-mates for the briefing. I took my salt tabs and ginger pills, had my wetsuit zipped up and was ready to go [and get this thing over with]! This was not an in-water start, which meant everyone lined up on the beach and took off when the gun went off. I had no idea where to line myself up. We had to swim out beyond a jetty and then make a right to enter the bridge. Starting too close to the jetty might make it harder to get out there, but starting too far on the other end would mean a slightly further swim, and more against the current. So... I randomly picked a spot. Good choice? Who knows... There was definite nervous energy as I waited for the signal to go. 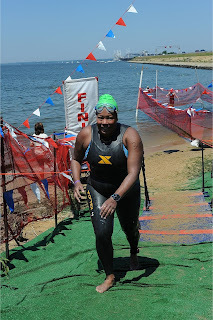 This is actually a photo Daz took from later in the swim, once I left the bridge spans! Finally, we were off. I had my ear plugs in, so I couldn't really hear anything but all of a sudden everyone started racing into the water. I hesitated so I didn't get kicked and swum over too much. This was it, the thing I'd been training for since January was finally happening. I'm not sure if I found a rhythm or not, but I made my way out past the jetty, fighting the current to the bridge. It wasn't super horrible and that part took less time than I thought. OK, time to just settle in, there was a lot of swimming ahead of me. Once between the bridge spans, I didn't really notice the current to much, but boy was it pushing me to the left side. I really had to fight to stay inside the zone. Like.. really fight. It was way too early to even consider giving up, but man this was hard. I wanted to get closer to the middle, but couldn't. The first mile marker came and I was already struggling going into what had been defined to me as the hardest mile. 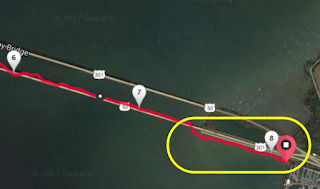 I was really concerned I was not going to be able to hang on before drifting outside of the west-bound bridge span and pulled from the swim. 7th interval I was really tired... and then a "dash" to the finish! Finally, as I approached the second mile marker the current seemed to relax a bit. I was now more firmly in the center of the bridges, which eased my mind tremendously. Now I could just swim. And swim. And swim. I looked up a couple times but still couldn't see the other side of the bay. I could tell I was under the highest part of the bridge so it had to be halfway.... right? 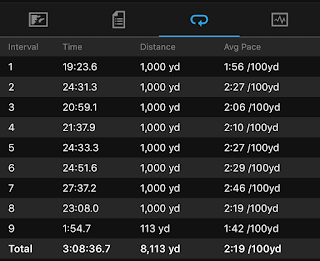 I had my watch set to go off every 1000 yard interval, and knew that the swim was going to be about 7700 yards total. It had only gone off 3 times, but the third time was a few minutes ago so I was probably at least at 3500? I was getting a little tired of swimming now. I took this shot after I finished but those are the trusses on the left which I *thought* were close to the end! I noticed some trusses on the bridge up ahead and figured I just had to get there. That was going to be my next landmark. They didn't seem to be getting any closer. Then I started counting the pylons, except that got boring fast. I was getting seriously annoyed with how far away those trusses still were. 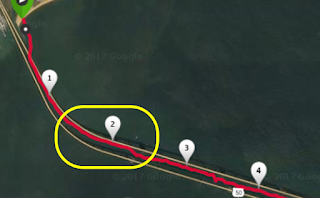 I must have missed the third mile marker and the second support boat because I knew from my watch beeping that I was in my fourth mile. 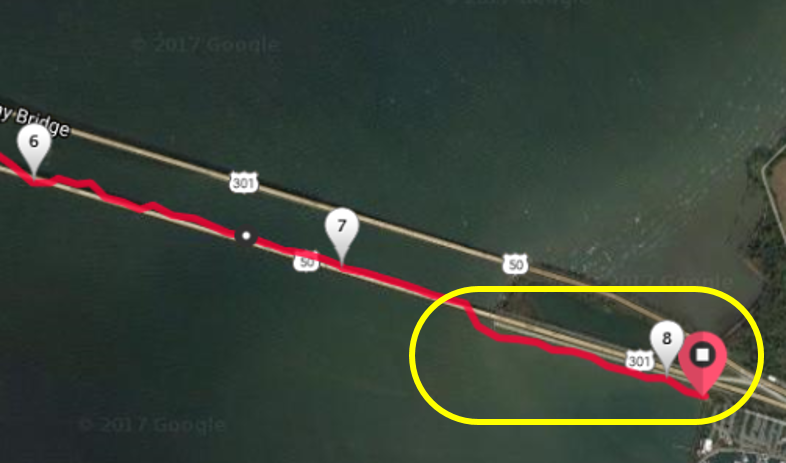 The map kind of makes it look like I went all the way under the bridge, but that's an exaggeration. I was barely under the bridge, not even all the way on the other side of the single pillar. At some point the current must have picked up in the other direction because now I found myself drifting to the right. I'd finally made it to those trusses and decided to breathe to my left for a bit to change up the muscles I'd been using. All of a sudden the water got dark and I immediately realized I must have drifted into the shadow of the east-bound bridge span. Yikes! I swam furiously back into the middle and hoped it wasn't enough to get me pulled. Luckily there were no kayaks around me and nobody said anything. 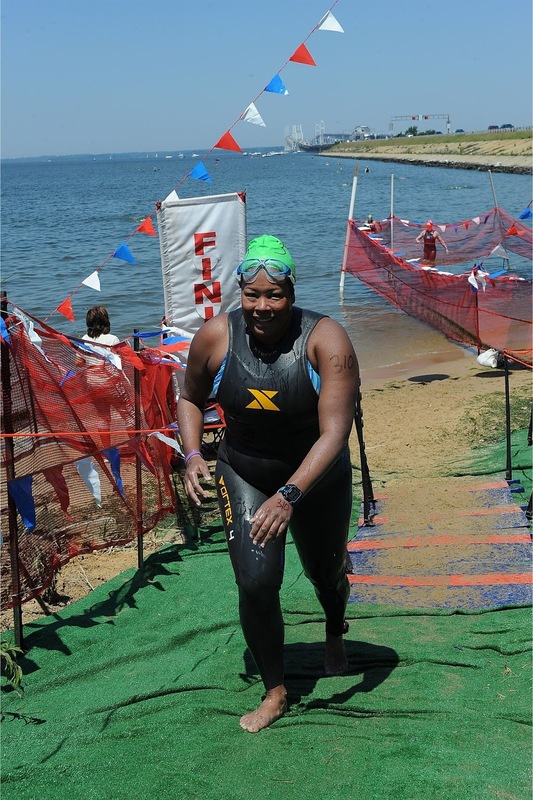 At this point I didn't even care if I was disqualified as long as I got to finish the swim and be able to say I swam across that damn bay. b/c I popped up around that yellow buoy only a min or so later! As I got to the end of those trusses I'd been following, I looked up and was so happy I could see the orange buoy! That must be the end where we get to turn out from under the bridge! It was still pretty far away but it made me happy to be able to see it. My fingers were starting to hurt, my shoulders hurt, my arms hurt, my back was killing me. I did a few stretches swimming in the fetal position to try to ease the pressure on my back. Come on orange buoy! That was a LONG way from bridge exit to finish line!! 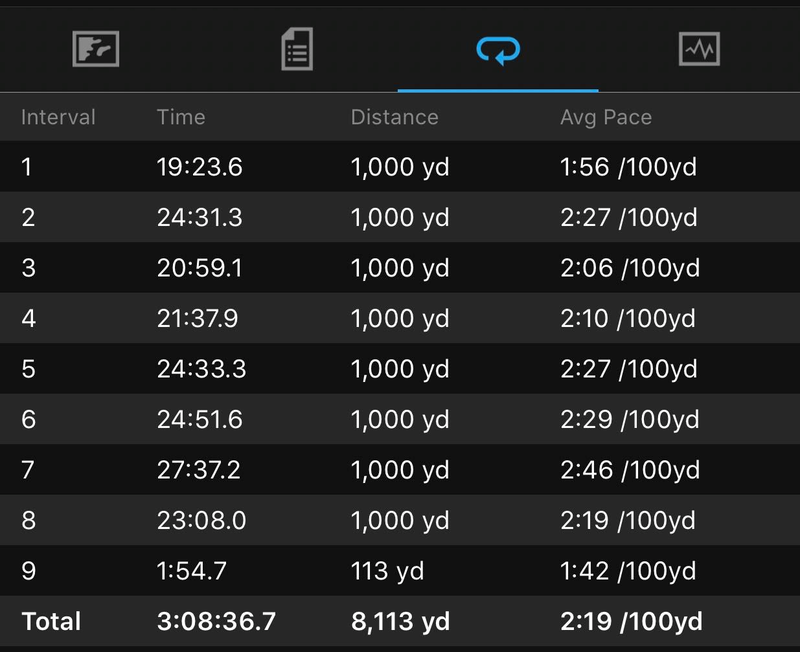 4.4 miles = 7744 yards, so the fact that I have an 8th interval marker means I swam extra! 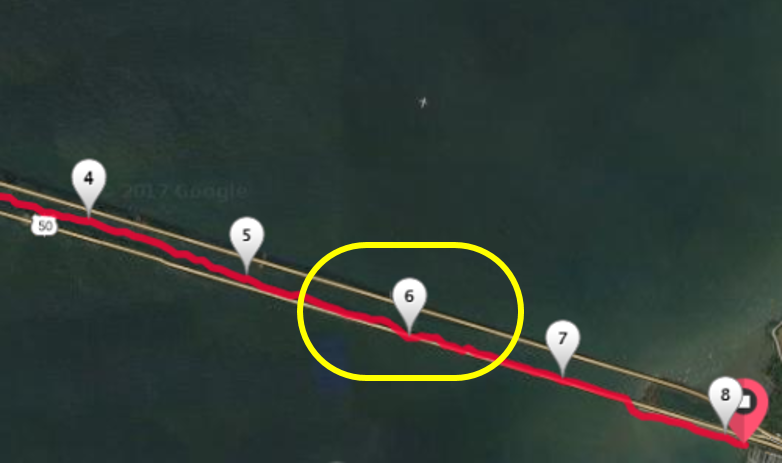 Except, when I finally came up to that buoy, I realized it was only the fourth mile marker. D'oh! I glanced up again and noticed 2 yellow buoys in the distance and THOSE were the signal to exit the bridge. Damnit. Keep swimming. I was so tired, but at this point there was no way I was giving up. As much as it sucked, I knew I was physically capable of doing this. I never wanted to have to do all that training again, and I definitely don't want to have to do this event again. One and done, but that meant I had to actually get it done. Luckily, despite my one scare, it wasn't as hard to stay within the bridge spans as earlier when I was getting pushed to the left. 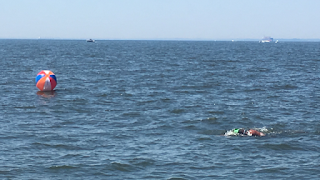 This was the final buoy, outside of the bridge, guiding us to the finish. Made it to the yellow buoys, I was almost done! 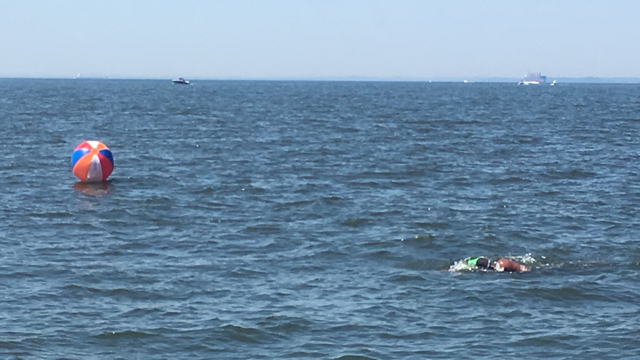 The only thing left was to exit the bay and swim to the finish line. The night before, Andrea was telling me that it was shallow enough there that you could stand and walk. I knew I can swim faster than I can walk in water and dismissed the idea. Yet, as I rounded that corner and saw just how far away the marina was, I stood up in disbelief. You've got to be kidding me! I have to swim THAT MUCH FURTHER?! I was so mad. Daz was out on the rocks taking pictures and even noted to Joann on the phone that I looked cranky. I swam some. I walked some. I did some dolphin dives. I stayed as close to the rocks as possible for the shortest possible route to that finish line. The end was in sight and yet it was taking forever to get there. In actuality, it took me about 10 minutes. I did one last dolphin dive and started swimming to the end. Finally, finally, finally, I was close enough to stand up and walk out to the timing mats. I DID IT!! I walked up the short hill to find Joann and Paula cheering. I paused for a picture and actually got confused where to go. A nice volunteer pointed me in the finisher chute where I saw my mom, friends and teammates. My stomach was going nuts so I grabbed sprite and Gatorade, not sure which would help more? The chute seemed to go on forever... grab a drink which I was in desperate need of... get your t-shirt... eventually Joann forced her way in the end of the chute to help me take off my wetsuit. Her, Paula and Daz helped me collect my stuff and pick up my bag drop. I got hosed down a couple times and we walked over to the restaurant where Sarah, Dave and Jon were saving a table. It felt so good to sit down! We spent the better part of the afternoon hanging out at Hemingway's, hesitant to sit in the traffic that was building up going back west across the bridge. Bucket list item accomplished. I will never drive over that bridge and not remember that swim. I will also never sign up for that event again. So glad I did it, but it really sucked. I hated swimming that long.